Listen to the interview (approx 1 hr, 3 min.) or download it. Graduated in 2010, with a major in Performance. Principal instrument: guitar. Position: Systems Engineer at General Dynamics Propulsion Systems. General Dynamics is a large military contractor which builds both military vehicles and communications equipment, with private clients as well as government contracts. As an electrical engineer there, Shawn is expected to work on many different projects to round out his experience. He works on a team that analyzes different designs and pieces of new communications equipment to make sure they will meet all specifications to do their assigned task. This involves a lot of tasks, including communications, programming, and troubleshooting. 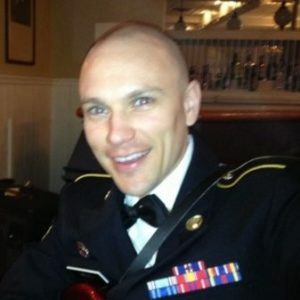 Overview: Prior to Berklee Shawn completed a 4-year enlistment in the U.S. Air Force, and earned an associates degree in electronics, but he really wanted to be a musician and came to Berklee with help from the G.I. Bill, while remaining in the reserves Afterward, still in the Boston area, Shawn tried to join the army band, but as it was a different services he was only allowed to join a reserve band, which was very part time. For five years Shawn played in this band while supplementing his income mostly by teaching guitar and some bartending. But he started to sense that he wasn’t on a good long-term career path. Then he had a terrible accident with a long recovery during which he wasn’t able to teach or play guitar, and he decided that he wanted to pursue a degree in Electical Engineering (“EE”), at least so he’d have a backup plan is music didn’t work out. He took some classes at Bunker Hill Community College, did a semester at Texas A&M but didn’t like the program, then transferred to Arizona State University, where veterans all pay (lower) in-state tuition. While at ASU, companies recruited people for internships. Shawn did internships at both Raytheon and General Dymanics, received job offers (contingent on receiving his Bachelors degree) from both, and he decided to stay in Arizona and work at General Dynamics. You an see Shawn’s LinkedIn profile here. See the full index of successful Berklee alumni.